Why Not . . . Style a Desktop? An office space can offer the portal for the artist to create a divine illustration, the writer to craft the perfect phrases or the entrepreneur to keep the business thriving and magnificently managed. Depending upon what we need our office space to aid us in creating, produce or finish, our office spaces will be unique to our purpose, but also to our tastes. 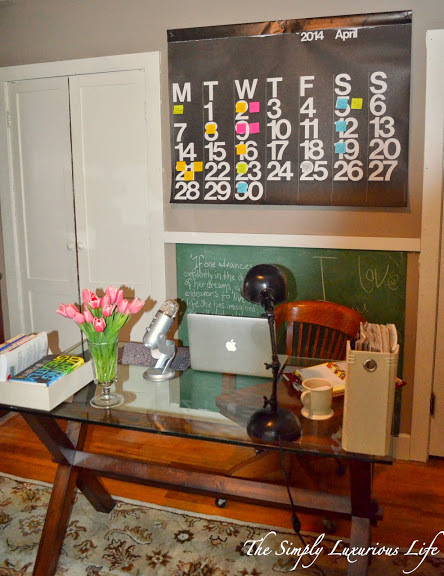 While there are always a few blog posts that are crafted in my living room, dining room or for last minute typing, my bedroom (the benefit of having a laptop), most of my blog posts for TSLL are crafted in my office; however two years ago, my office wasn’t entirely enticing, so I wanted to create a designated office space that was as inspiring as it was conducive to high productivity, and after the last addition this last fall thanks to my illustrator Inslee, the space is finally complete. 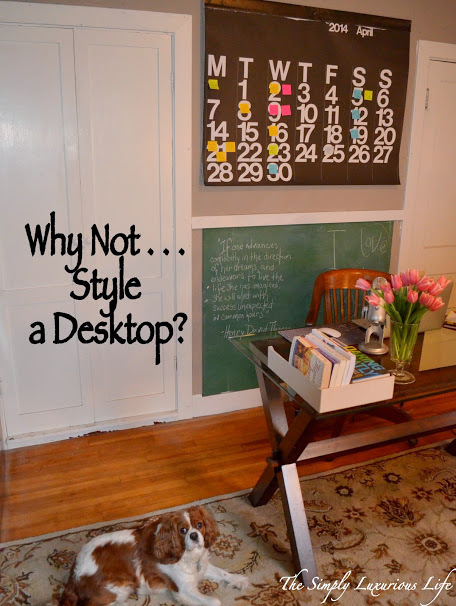 Today, per a recommendation from a reader, I’d like to share simple tips and ideas to help you style a desk that is not only properly functional for your needs, but also a space that beckons you to sit down and begin whatever it is you want to get done. The reason you need your desk will determine what type of desk you should bring into your space, how much tabletop space you need and how long you will be seated. If you have a small space, but still need an immense amount of room, do what I did and buy a glass top desk. While providing ample working room, it doesn’t appear large and seems to almost disappear. Inspired by Jonathan Adler’s Channing desk, I invested in Pottery Barn’s Ava desk and have been thrilled with my decision. Lighting should allow you to work without straining your eyes, and while natural lighting is best, we all know we’ll be working at night at one time or another, and I am not a fan of stark overhead lighting. While on sale this winter, I snagged Pottery Barn’s Harrison bedside lamp, but there are wonderful, unique lamps just about anywhere. In fact, I suggest shopping at your local consignment shop as you can pick up a beautiful base and then find the shade that suits your taste. Again, always keep in mind what tools you will need, but upon knowing that, find a few desktop essentials for keeping it neat and tidy. West Elm’s desktop trays and file box were perfect for holding the most recent issues of magazines that arrive monthly/weekly and for holding pertinent documents that I need to quickly have access to. Also, find an antique or monogrammed mug for your writing utensils and any other small unique holders for the tools you use regularly. A desk or office without inspiration is pointless. After all, if we must create when we sit down, thus, we need to be inspired. 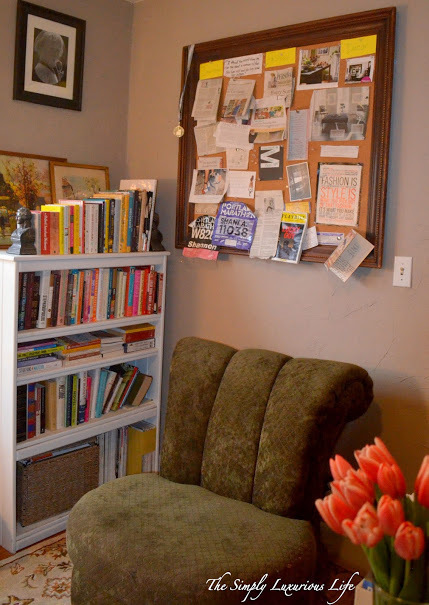 So keep a few books, a framed picture, or artwork that upon looking at it or picking it up to flip through will fill you with ideas and jumpstart your engine. 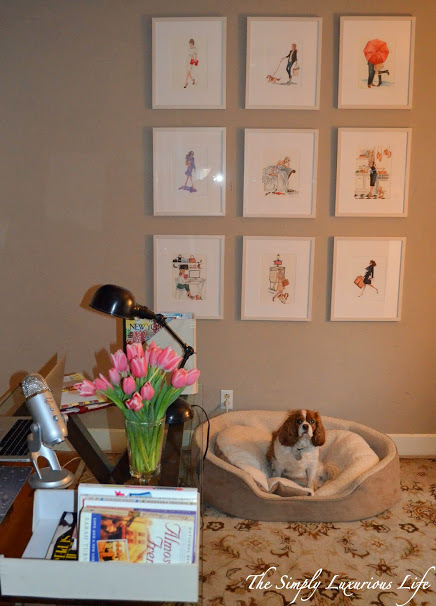 While my desk always has books atop it ready for me to use for a post, I also wanted to frame all of the illustrations Inslee has created for the blog. And, in case you were wondering, yes, there are few new ones as we have been working together on the artwork for the upcoming book! More details to be shared in the upcoming months. Stay tuned! Also, keep an inspiration board nearby. I used to keep my inspiration board behind my desk, but then realized it wasn’t doing me any good because I couldn’t see it when I sat down. A few months ago I moved it so that when I look up from my desk I can instantly see what I have pinned to the cork. To create create my inspiration board, I found a frame at a yard sale, cut out cork board to fit and Gorilla Glued it tight to properly sized cardboard. A workshop staple gun and done! 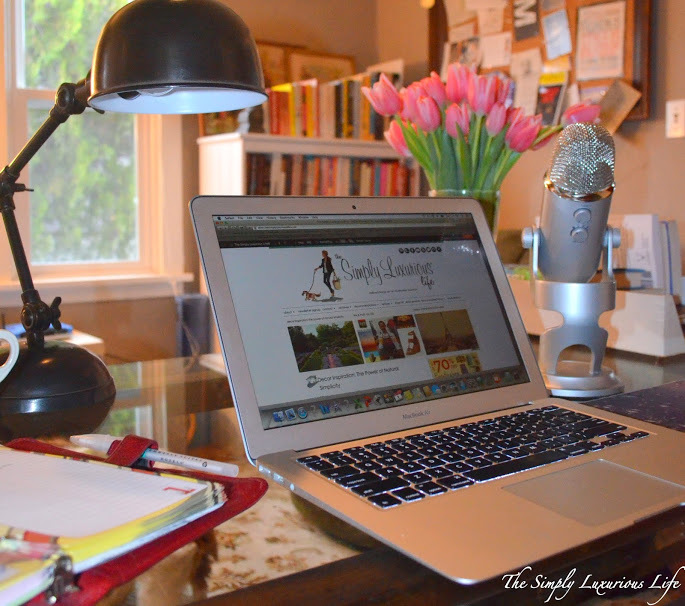 While I’m not held back by feng shui rules, I do believe that where you put your desk, the view you see each time you sit down, can affect our mood. Also, I agree with the idea of not placing the desk so your back is toward the door. So with that in mind, try to arrange your desk so that you either look outside or at the door to immediately greet whoever might walk through. Stepping away from the desk for a moment. 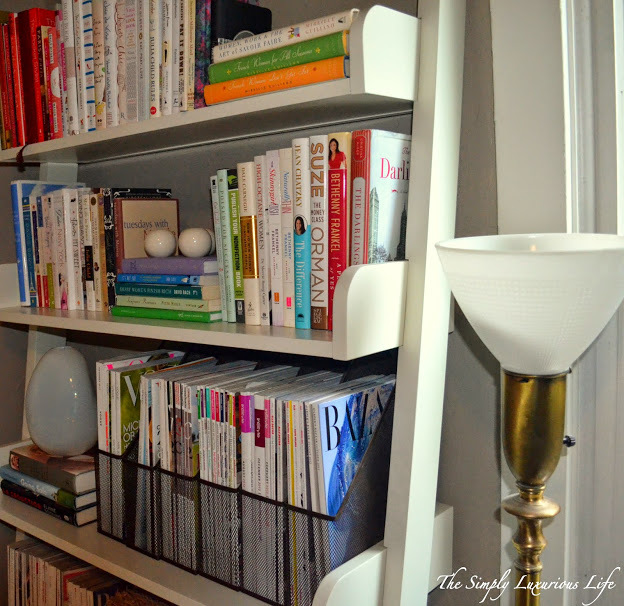 Bringing in the necessary storage shelves for your books, files and documents so that you can easily access whatever you need whenever you need it is an opportunity to add your signature style. 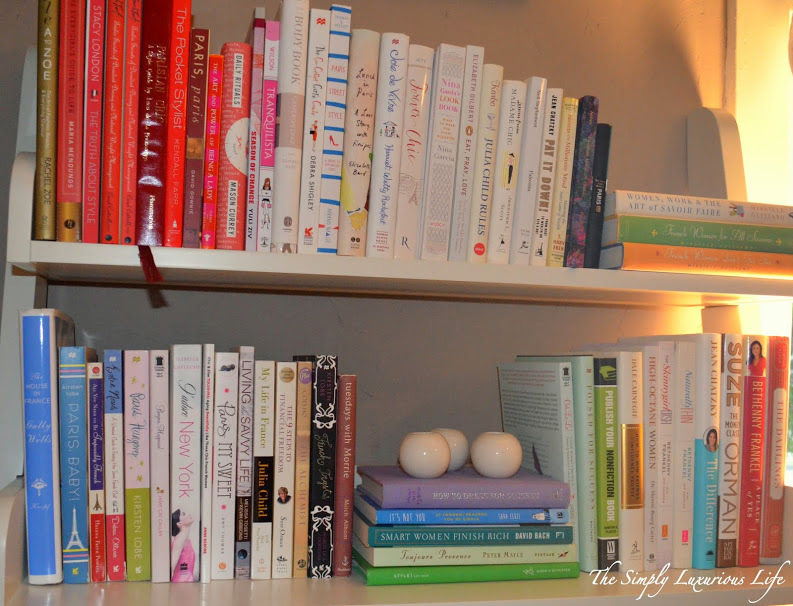 With one shelf given to me by a neighbor and then painted white, and the other from Pottery Barn, I have quickly filled them with books and am trying to determine where to put the next shelf for my prolific collection. Now that you have your tools, lighting and material organized, make sure you have an empty space to work or place your computer. While there will always be times when my desk is cluttered with newspaper articles I want to keep, books I need to read and new magazines waiting to be enjoyed, initially make sure that when all is organized you have a clean desktop which then will keep your mind uncluttered as well as you create, plan and dream. Every desk needs some type of planner. Now if you have a calendar on your phone or computer and don’t wish to have a paper version, you may not want to do this, but there are two planners I prefer to have in my office – my Franklin planner and my over-sized monthly calendar from Stendig which for only $40 is not a bad annual price to pay to keep your schedule at the forefront of your mind. As someone who considers planning a hobby, I love my monthly ritual of sitting down and working with my post-its to create my editorial calendar for the blog. As a visual learner, seeing my month laid out helps me to understand the demands and expectations I have set for myself. A beautiful bouquet, a stunning orchid or a house plant that brings the outdoors in seems to instantly awaken my muse, lift my mood, and I can’t help but create. While the office that works best for me took time, as I began acquiring some of these items (the upholstered chair for example) ten years ago, it has been fun seeing it all come together. The gift of time is that we are able to better determine exactly what works best for us and the homes we live in. And the ideal office and desktop space for you will be curated to your precise and unique tastes. Have patience with yourself, but know that eventually you will create a space that you can’t wait to step into and get busy. 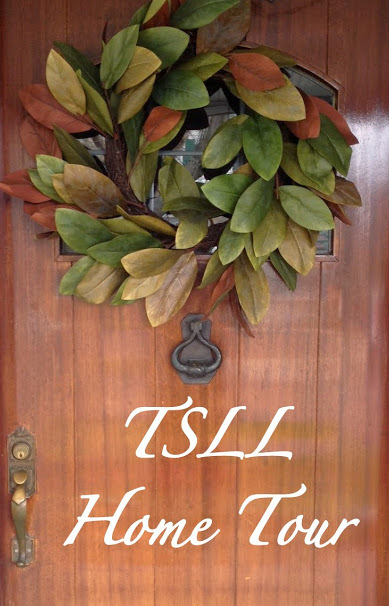 Thank you yet again for coming along with me for TSLL Home Tour. If you would like to see the first two rooms, click below, and click here to see the fourth and final room in tour (hint – London played a lovely hand). WOW!! That was once again a simplx luxurious room in your house. Thank you for sharing. I am so excited about the book and the podcasts. Looking forward to it. There’s going to be a book?!? And podcasts?!? That’s awesome. I have been loving your beautiful house tour. A PODCAST?!?!?!? How exciting! I love podcasts, I listen while I run, drive, and work in my yard. I can’t wait to add TSLL to my listening queue. I too have found myself listening to more and more – simple and can be enjoyed on our own time (which I love). Things are coming together, and I can’t wait to premiere them. Thanks for your excitement! Thank you for this wonderful post Shannon. You have addressed several area I’ve been uncertain about. Thank you for the lovely office tour! I am very excited for your book and podcast! I was driving through your town on the way to Portland last week and thought of you while dining at the Prodigal Son. Thank you for the city guide recommendation link! I have a question regarding office organization. How do you keep paperwork (bills and receipts) organized and stylish? 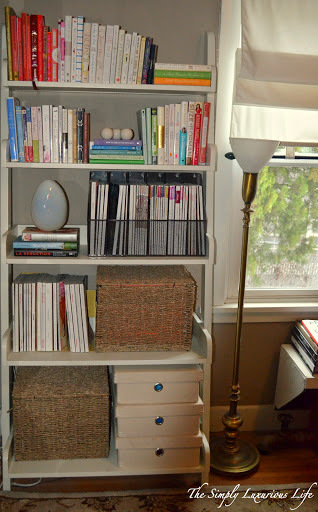 Great question – I color code the files as well as the hanging files and then place them in file baskets on my bookshelves (you can see them in the photo). While you don’t see them initially, when you open up the baskets, everything is neat and tidy. I hope that helps. Such a beautiful home office! Looking forward to the podcasts and book – congratulations! Thank you so much! 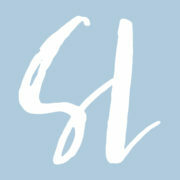 I look forward to sharing more of my life and answering even more of my readers’ questions. Shannon somehow I missed this post this week, thanks to the weekly newsletter I have caught up! I really need to sort my desk, in most parts of my life I’m neat and uncluttered but my desk is a horror. 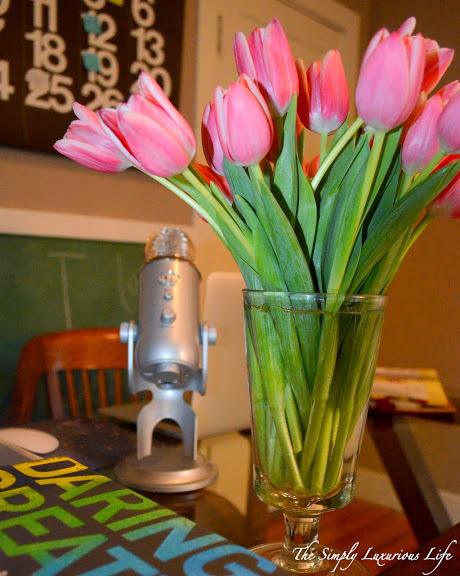 Hello Shannon–your office is gorgeous–and what was that about a book? AND podcasts? Congratulations! As a fellow teacher, I cannot imagine how you do all that you do, on top of successfully managing a job that’s already far beyond “full time.” I too am a devoted planner, and if you’re ever looking for content for future work, it would be wonderful if you would consider sharing some of your time-management methodology. If it’s a proprietary secret, though, I’d understand. 🙂 As always, thank you for sharing your thoughtful writing and your beautifully-designed blog. 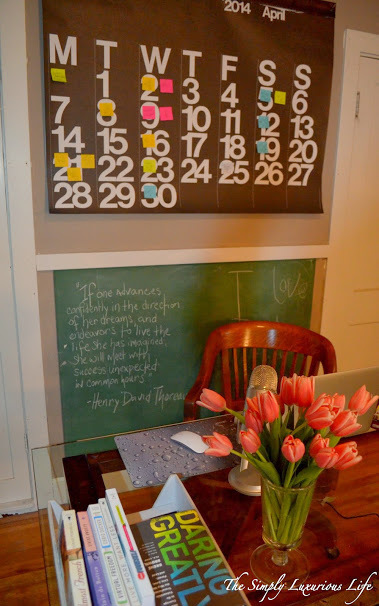 Loved this post and have been working on giving my office a facelift. I went ahead and splurged on the Pottery Barn Ava desk also and just love it! I am now excited to get down to my office to work. I also added a lovely (subtle) scented candle that I sometimes use for fragrance. I just love my new workspace, thanks for the inspiration! Love the prints on the wall. Can they be purchased somewhere? 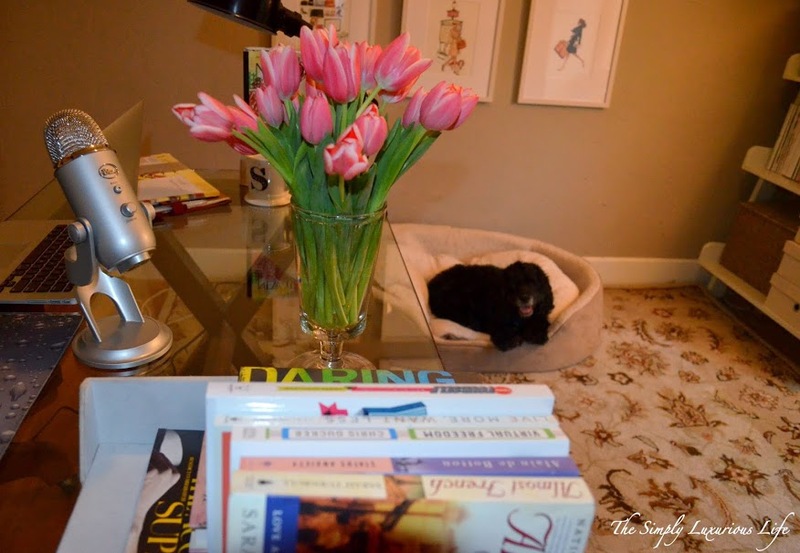 Have you done a post like this for styling your nightstands? I just got new nightstands and lamps but am stuck when it comes to styling them.